The only thing that might not work is that plating doesn't build up like that. I don't know whether or not it does, but the best way to find out would be to try it. You have the molds, so why don't you try it out? Even if it doesn't work, it would look really cool. I think the plating is dependent on there being a flow of the electrolyte over the surface being plated. I suspect your scheme would work well until the accreting object began to strike the walls of the mould and obstruct the flow of metal ion rich electrolyte. Plating won't build up like the smooth layers of an onion, or a dip candle. You'll get knobs and spikes on your "core" as the object grows, which will lead to cracks and voids in the finished object. The accepted way is to build a mandrel of a hard, conductive material, and grow a shell within that. You can play nice tricks by switching the electrolyte bath several times, making a laminate material. IIRC, it's used to make pen barrels. I know that columnar grain growth can be frustrated in vapor deposition by adding an impurity metal that interferes with crystallization. If you could find the right mix of salts, this could make a very strong material. It would require lots of energy, though. The point about plating slowing as the surfaces got closer together may be good, not bad, as that's what makes the part conform to the mould. I'll try it when I get a chance. Meanwhile, I've just cast Wood's metal in silicone, and it works really well. See href="http://reprap.org/bin/view/Main/SoftToolingForCasting#Other_materials">here. How about using an electrode with a large surface area that can be shaped to nearly fill the cavity? Something the consistency of steel wool, for example. The process is called electrodeposition, http://en.wikipedia.org/wiki/Electrodeposition and it has been in use for quite a while. Some fascinating recent results include the ability to produce nanoparticles by applying very high voltages and/or currents; of course that doesn't apply to what you're thinking. Smoother surfaces may be achieved by performing the process in a magnetic field. Maybe if you cut the mold from a stiff but porous material like a ceramic foam you could immerse it and allow the ions to flow through? It's galvanic "electroforming" of thin-walled nickel-objects from (later dissolved) aluminium-parts. I have some samples made from nickel and some gold-covered bellows and contacting-tools too. Maybe an idea in combination with the paperwork-print-fabbing ( http://forums.reprap.org/read.php?73,7812 ), when using cartonage-sheets covered with aluminium-foils to get rigid objects? Is there any way to make the mold conductive? That would help with growing the metal from the outside in. 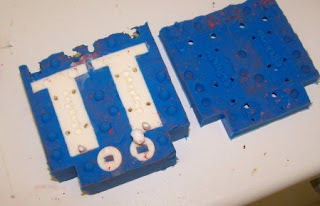 Perhaps you could spray-paint some kind of a conductive layer onto the inside of your existing mold. "a stiff but porous material like a ceramic foam"
Steel wool is intriguing, since it cuts down on the total electric charge needed & gives the whole thing a fiber-reinforced quality. However, there'd be some voids that would end up filled with electrolyte; bad mojo in terms of pitting corrosion and overall mechanical integrity. ... when you want a porous ceramic-like object, then you can fill the inner volume with small polystyrol-balls (not the bulk material) and fill the volume between the polystyrol-balls with a hardening and heatresistant liquid (waterglass for example). Then fire the object, so the polystyrol fumes out and you have a rigid porous part with the shape of the preformed object.